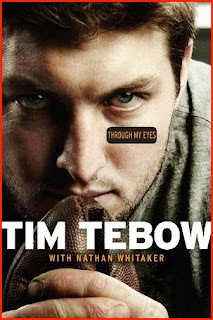 Review: 'Through My Eyes' is a memoir of sorts written in the first person by former Florida quarterback (and current 3rd string quarterback for the Broncos), Tim Tebow. While I lived in Gainesville for several years, I never attended a game and don't follow SEC football. That being said, as a former college athlete myself, I appreciate hard work and a competitive spirit. I am skeptical when someone Tebow's age (early 20's) writes a memoir-how much can one person really experience in such a short time that warrants a book? Other than sports accomplishments...not too much. Anyway-My husband told me "everyone" told this kid he wouldn't be successful and he proved everyone wrong by accomplishing all these things. Well-after reading the book, I disagree with that sentiment. Tebow and his siblings were all home-schooled but very active in sports. When he was in high school, the coach did not want to play him as a quarterback so his parents shopped schools until they found one that agreed to play him (they moved into an apartment so he lived in the district). In summary-he was a competitive kid, successful basketball, baseball and football high school athlete, excelled at the University of Florida where he won the Heisman and lead the team to 2 National Championships. While he describes off-season workouts that I really enjoyed learning about, several pages (seemed like almost half the book) were dedicated to extreme detail about college football games (maybe someone more into football would appreciate those sections). He is extremely religious and while he comments multiple times that he is flawed, he shares very few personal stories. There are a few exceptions-notably a section about his family dog that I found endearing. If you are an Evangelical Christian (Tebow is very resonant in his faith) and football-you'll probably love this book. I found certain aspects entertaining (I keep telling my husband about the workouts, they sound so brutal yet intriguing) and I appreciate Tebow's competitive spirit and work ethic. He seems like a generally nice person and I wish him the best. It wasn't the most engaging read, but not the worst.